Full disclosure: it does appear that there was a market at certain points for cat skins. Bartholomew de Glanville mentioned this in a thirteenth-century history, and Langland’s Piers Ploughman mentions a pedlar of such, who ‘would kill if he could for the sake of their skins’. People were also quite horrible to cats during things like witch hunts (when, to be fair, they were also quite horrible to each other) and the Black Plague, and during strange awful things like the Kattenstoet in Ypres. While not treasured the way, say, horses were, I’m not sure they suffered more than people at the time; concern about the sanctity of life in general was not really at its highest around the thirteenth century. The value of a kitten from the night it is born until it opens its eyes, a penny, and from then until it kills mice, two pence, and after it kills mice, four pence. Eleanor de Montfort (Countess of Leicester, not her daughter who married Lleweyn the Last) bought a cat in 1265; it doesn’t specify whether she wanted it for snuggling or because her fortress had a mouse problem. She did have a reputation, however, for liking animals in general. Exeter Cathedral, meanwhile, had a cat on the payroll. Fifteenth-century accounts list its salary as a penny per week, so it wasn’t working purely on commission and eating only the mice it got rid of. There is still a small cat door to the cathedral’s south tower. It might have looked like this, hard at work. Bestiaries are the first place to look for any sort of animal, of course, though they’re not the only place we find cats. Isidore of Seville suggests that the Latin word ‘cattus’ may come from ‘to catch’, as in what they do with mice, or else because their eyes capture the light. But cats are also found in manuscript illuminations, like the one above. 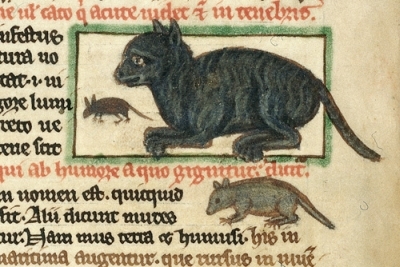 They are often chasing mice, though not always–the British Library has a list of some of the more humourous ones, including a cat defending a castle from the mice who have it under siege! Cats are also mentioned in courtesy manuals such as The Boke of Nurture, which asks the host to dryve out dogge and catte, or els geve them a clout, which rather suggests that both sort of pet were frolicking about the tables waiting for people to drop food, or else just helping themselves to it. 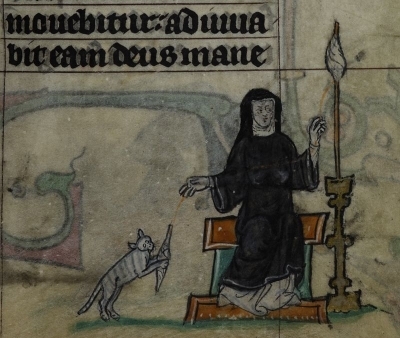 The Ancrene Wisse is explicit that while hermits could own three acres and a cow, there was only one companion suitable for an anchoress; it reads ‘shall not possess any beast, my dear sisters, except only a cat.‘ Again, if they were that evil, they would hardly have been fit companions for women who had given up all earthly society in favour of contemplation and prayer. 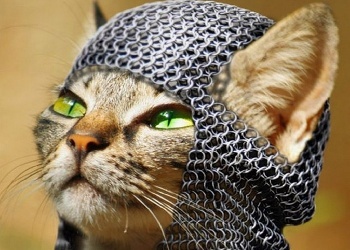 And then, of course, if you are the sort of person who follows both medieval things and cats, you will have seen this fellow floating around the internet. 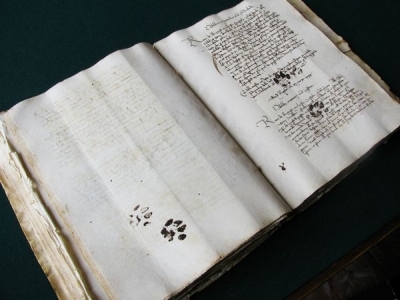 He left his mark quite literally on a fifteenth century manuscript, and it’s not hard to envision the poor monk sitting there copying away, trying in vain to keep his feline companion from messing up his work. Not that we know anything about that in the modern day, of course. I mean, don’t laptops just automatically come full of cat hair? That is a person who is very fond of his cat. If you’re still curious (or not convinced), check out the book Medieval Cats by Kathleen Walker-Meikle. 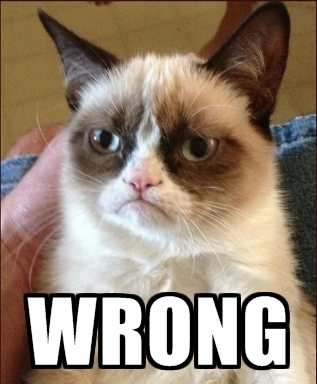 It really turns out that even after Egypt, cats kept this world-ruling thing pretty well in hand! Sorry about the last one, WordPress hateses Android for whatever reason and I could barely get anything typed on my phone. ANYWAY I was really confused because I was sure you knew the difference too. Also while I am not any sort of expert on medieval spinning I’m pretty sure she’s spinning flax. Also also if you ever get a cheap spindle and a cat in the same room, it is hilarious if you’re not actually trying to get work done. If you are, I would kick the cat out of the room. Thank you for this very interesting article, lots of things I didn’t know.